With the official launch of Intel’s latest generation of Xeon Scalable processors now underway, Intel’s major partners and OEMs are announcing updates to their product lines using the new hardware. Dell is one of those primary partners, and reached out to us late last week to fill us in on the new details. Dell is focusing mostly on the midrange performance boosts, as well as offering Optane solutions to the markets that can best take advantage of it. We spoke to Brian Payne, VP of Product Management & Marketing, who stated that last year was a very successful year for the PowerEdge business with record growth numbers, so there is a lot of momentum being carried into 2019. The company plans to carry that momentum by innovating on Intel’s performance metrics with the new generation of PowerEdge, specifically looking at workload-optimized product lines, new technology focused products, and all with a veneer of additional security above and beyond Intel’s own. It’s safe to say that what Dell’s PowerEdge customers were able to buy with Intel’s first generation Skylake Xeon Scalable processors will be offered with the second generation Cascade Lake – by virtue of the SKU separation, this means that in the middle of the processor stack, offerings will have up to 25% more cores for the same price as before, and/or be able to take advantage of the frequency increases. These type of headlines are going to be consistent across all of Intel’s OEM partners, and although it is an essential part of the marketing blurb, I quizzed Dell on the separate innovations it is bringing to the table beyond Intel. Brian and I discussed the new workload-optimized products that Dell plans to sell under the PowerEdge brand. Normally when we speak about workload optimization, we either mean dissecting the software instructions to get a higher IPC and extracting more performance – when we apply the same label to OEM products, it gets difficult to see how ‘optimized’ a product can be aside from adjusting the cooling / memory / storage / networking installation to remove bottlenecks. 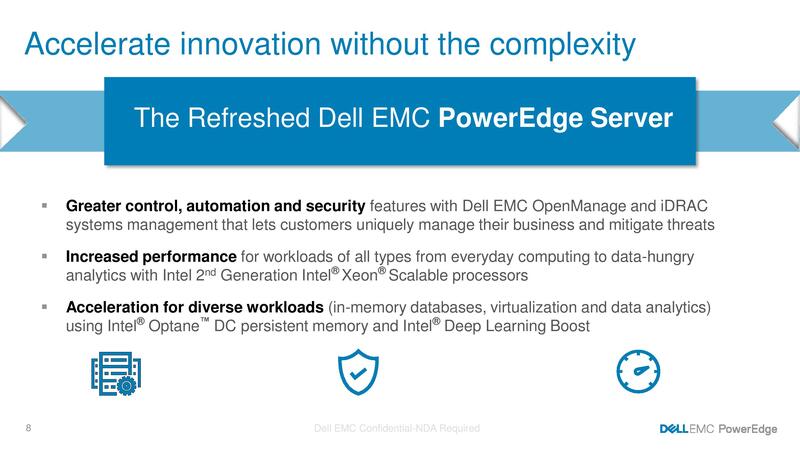 As Dell is practically vertically integrated with respect to the system level element of PowerEdge: it builds its own motherboards, BIOSes, and management tools, allowing the company to offer distinct optimizations. I quizzed Brian on Dell’s BIOS enhancement strategy – is this just staying within Intel’s recommended specifications? Brian confirmed that they actually tweak beyond Intel’s defaults; this includes things like memory sub-timings, power adjustments, turbo response, PCIe switch calibration, memory training, and RAS features beyond the processor. 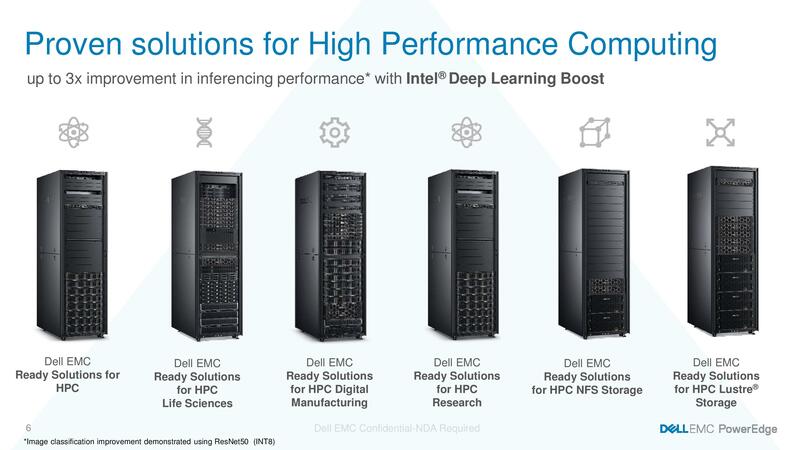 This becomes important for systems for tweaked performance settings, but also as Dell has to provide additional support validation under its customers requirements, such as FPGAs, SmartNICs, and other PCIe/connected devices. The exact benefits will be system dependent, and it was confirmed that these are automatically set for the customer when they buy into a specific line of PowerEdge, or customers can customize these options themselves. Dell offers ‘zero touch’ configurations, allowing system administrators to update the firmware configuration companywide in a one-to-many scenario. Under the new technologies category, this includes helping developers prepare for new connectivity standards such as PCIe 4.0, GenZ, and CXL, but in most cases it is around Optane DC Persistent Memory Module support. Ultimately there are two ways to use Optane DCPMM to its fullest – as an expansion of main memory (known as Memory Mode) for up to 6TB, or in a RAMDisk like scenario (App Direct Mode). In speaking with Dell, it was clear that customers who need more memory will use the Memory Mode method, and that this is going to be the first wave of orders. Users who can take advantage of App Direct mode are more likely going to need time to redevelop their software to take advantage of the new technology, and as a result Dell expects to see those customers pick up later in the year. Broad General Availability for Optane DCPMM based systems is expected in June – Dell states they expect to meet this target and the supply chain for Optane is expected to be in place well in advance. For these Optane DCMM based systems, Dell is also offering a PoC program for customers, allowing them to test the hardware for 1-2 months to see if it is a right fit for their workflow. It is worth noting that when Intel launched the first generation of Xeon Scalable processors, the company stated in its briefings that only 5% of its customers actually needed high capacity memory systems. From Dell’s point of view, that number is increasing as demand for larger memory footprints / getting data closer to the compute is becoming a growing need in the industry as use cases have developed for AI and Big Data. 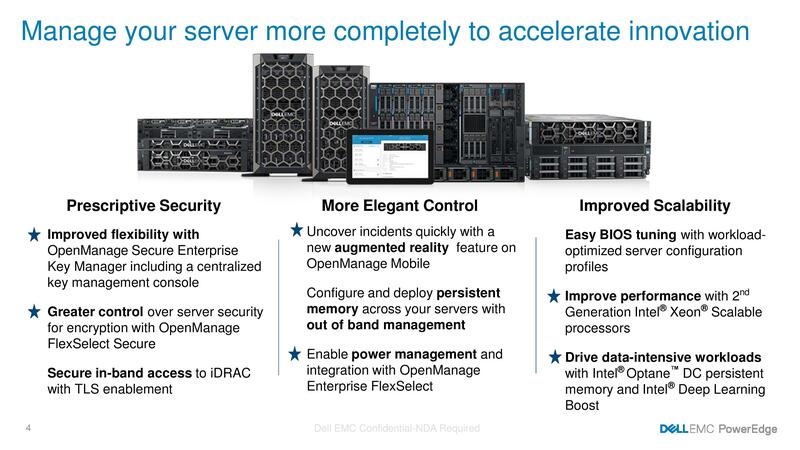 The third avenue that Dell is pushing with its new PowerEdge systems is security. Intel has already created Cascade Lake with hardware fixes for Spectre/Meltdown variants 1, 3, 3a, 4, and L1TF, however Dell’s security implementation revolves around its OpenManage and iDRAC infrastructure. This includes new storage security mechanisms as data is moved closer to the customer – stored data can use location-specific hardware keys using a company centralized key management system, such that if the hardware is moved off-site it no longer works. Also through the OpenManage console, Dell’s FlexSelect plug-in architecture is set to allow customers to develop their own security management plug-ins (or buy them from third parties), to further add a layer of security/obfuscation. One such plug-in cited by Dell was a power configuration plugin, allowing customers to manage the power output of their data center from a centralized console, which allows customers to either manage low power/backup power scenarios, of potentially offer productized offerings based on power using singular hardware. Alongside the usual PowerEdge mix of updates, the PowerEdge HPC line is also receiving updates based on Cascade Lake and the other enhancements. It should be noted that we asked if Dell was enabling a Xeon Platinum 9200 ‘Cascade-AP’ system at this time, using Intel’s dual-die processors for high-density 2P/4P equivalent systems. Dell stated that they were not announcing a solution on the 9200 platform at this time. In our call, Dell reiterated its commitment to x86 hardware, stating that it is focusing on a ‘software defined world’, built on x86. General Availability of Cascade Lake-based systems without Optane should be available from today, with Optane based systems coming in June. Intel Launches Optane DIMMs Up To 512GB: Apache Pass Is Here!